Autonomous vehicles are not yet a common part of everyday society, but the foundation is being laid, with retirement communities at the forefront of developing this technology. One company, Voyage Auto, is already testing out self-driving vehicles in senior living settings with an eye toward the future. Voyage, a Santa Clara, California-based driverless vehicle service, began testing self-driving Ford Fusions at The Villages Golf and Country Club, a 55-plus retirement community in San Jose, California, in 2017, Voyage Vice President of Strategy, Policy and Legal Justin Erlich told Senior Housing News. Last year, Voyage expanded the pilot to The Villages, an active adult community 90 miles north of Orlando, Florida. The company launched its Pioneer program, picking up its initial set of riders, at the beginning of 2019. The company raised $23 million in seed and Series A funding, with Menlo Park, California-based venture capital firm Khosla Ventures as the lead investor. Initialized Capital, an early-stage venture capital firm co-founded by Reddit co-founder Alexis Ohanian, is another investor in Voyage. Retirement communities make perfect sense as the place to test self-driving cars, and are part of a larger tech-driven reinvention of senior living that is underway, Ohanian recently told Senior Housing News. The feedback from residents at both Villages communities, and Voyage’s tweaks to the pilot in response, has given residents a stake in the program’s success. The company met with 25 social clubs and groups to educate them about the technology and how the program works, Erlich told SHN. Voyage representatives spent time walking residents through the technology, which is built around a sensor-based, 360-degree computerized model called a “point cloud” used to navigate the cars. High automation — where the car does most everything — would be helpful in retirement communities for individuals with mobility issues or [who] are visually impaired. Voyage also has vehicle operations specialists in the automobiles who can assume control in cases of safety issues or if the tech fails. All of this has made residents more comfortable with the program, Erlich said. “When you walk them through how it works, they then start to get it much more,” he said. Using data and feedback from the Villages San Jose pilot, Voyage upgraded from Ford Fusions to Chrysler Pacifica minivans at both communities largely because of feedback from Villages San Jose residents, who wanted to be chauffeured around in comfort. Irene Grim, a resident of The Villages in San Jose, California, exits a Voyage G2 self-driving vehicle. Voyage found the perfect proving grounds for its technology in the Villages communities. The Villages San Jose is a gated community. The Villages in central Florida encompasses parts of three counties and includes over 700 miles of private roads. The maximum speed on these roads is 25 miles per hour. This makes it easier for Voyage to test its self-driving tech in a self-contained environment than in a heavily trafficked public street or interstate, Erlich said. It also allows for a faster response if a specialist has to take control of the car, and damage is minimized in automobile accidents at speeds under 25 mph. “We’ve been fortunate to have not had any accidents,” Erlich said. Insuring autonomous vehicles also proved a challenge. Although California requires self-driving vehicles to have up to $5 million of coverage, Villages San Jose demanded more because — as a private community — it had a greater liability risk. Voyage’s cars are insured as any commercial vehicle fleet would be, Erlich said. Working with an insurance broker, the company partnered with German insurance group Munich Re on product liability coverage with the caveat that Voyage share its testing data with Munich Re, as a possible blueprint for insuring autonomous vehicles once they are ready for mass usage. 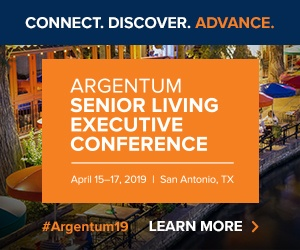 Although Voyage’s pilot is promising, a bigger test will be in scalability and bringing self-driving cars to higher levels of care in senior living, Majd Alwan, Ph.D., senior vice president of technology and executive director of the Center for Aging Services Technologies (CAST) at LeadingAge, told SHN. “High automation — where the car does most everything — would be helpful in retirement communities for individuals with mobility issues or [who] are visually impaired,” he said. The Villages, a retirement community in central Florida, has over 700 miles of self-contained roads for Voyage to test out its autonomous vehicles. Alwan sees autonomous vehicles as a progression of the disruption to transportation already happening in senior living. Ridesharing companies such as Uber and Lyft are giving seniors flexibility in their transportation options, and Lyft has partnerships with senior living communities where residents don’t need to order rides through an app. “They can order a car through resident portals and specify accessibility as a preference,” Alwan said. But the regulatory environment needs to improve if autonomous vehicles are to move beyond the testing phase. On the state level, things look promising. Twenty-nine states have enacted legislation related to autonomous vehicles, and governors in 11 states have signed executive orders related to self-driving technology, according to the National Conference of State Legislatures. Voyage is regularly sharing data with stakeholders on the federal and state levels, as well as offering ideas about leveraging safety data for further testing and legislation. Voyage is also looking to expand its pilot program to other senior living communities, Erlich told SHN, and is in conversations with several senior housing owners and operators.